Are you looking for RV or boat storage convenient to Kerr Lake and Falls Lake? At the AA Self Storage location in Oxford, we offer storage spaces designed specifically for RVs and boats, complete with an area for washing down your boat. Our Oxford boat and RV storage facility is also conveniently located on the way to Kerr Lake from Durham, NC. At our Oxford storage facility, we also offer tractor trailer storage. Our tractor trailer storage clients benefit from 24-hour access to their storage space. 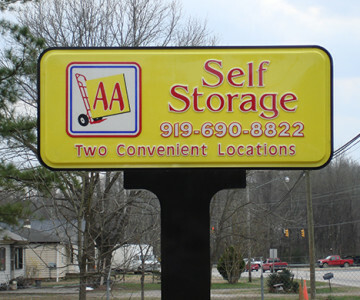 Take the hassle out of storing your boat or RV – let AA Self Storage help! Covered boat and RV storage units are coming soon to AA Self Storage in Oxford. Drop by today to take a look at our RV and boat storage spaces, or contact us to learn more.